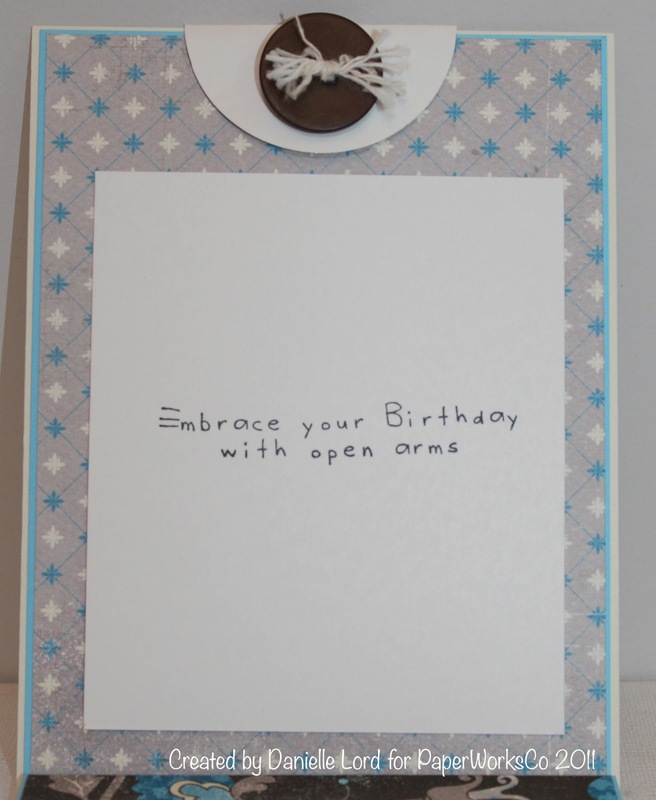 Delightful Designs by Danielle: Embrace your Birthday! 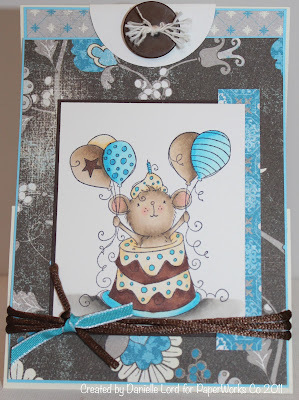 Anyways, I chose this style of card (not sure what it's called) and I used the super sweet RAM 'A Surprise Cheer' image. All the papers, card stock and embellishments are from the kit. I coloured with my copic markers (if you want to know what colours I used they are listed over on the PaperWorksCo blog. Here's a view of the inside back panel of the card which features the sentiment which comes with the stamp. Again, the papers are from the kit. Thanks for stopping in today. I start my job today and although I'm easing in gently with some training I'm really looking forward to it! I appreciate your visit and thank you for any kind comments you may leave! I hope you all enjoy the beginning to this week! I am loving those browns and blues Danielle. You have such a beautiful touch using the copics! Love the little tab on the top with the dark brown button! All the best with your new job Danielle. I too have started a new job working at Stamping Bella. I am teaching there a couple times a week and just love it. Emily, Helen and Dena are the best to work with! It sure does not leave alot of time at the blog station! Love your gorgeous, adorable card Danielle. Those browns and blues is beautiful. You have such a beautiful touch using the copics! The little tab on the top with the dark brown button is perfect. Wishing a best wishes with your new job Danielle. Abracadabra ... it's your Birthday!